"My dad was head of fish and game for Lane County," says Eugene native Dan Jubber. "I grew up fishing and hunting." Jubber competed in team sports with the Eugene Boys Athletic Association (now called Kidsports), and played in a state championship soccer game for Churchill, in an era when soccer was a club sport. "I was small, so I had to be agressive," he notes. He learned business skills in five years as a supply sergeant at the Presidio of San Francisco. "I worked with contractors and budgets," he says. "I did well and received awards." 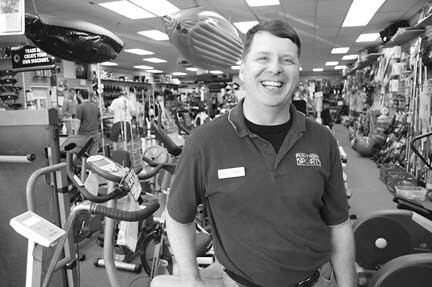 After the military, Jubber spent seven years with Bally Fitness in Seattle, eventually as manager of its largest facility. "I got burned out on 14-hour days," he says. "I moved back to Eugene in 2000." In 2004, he was hired as manager of Play It Again Sports. "I enjoy sales," he says. "I just like people. it's all about establishing a relationship with the customer." For each of the past three years, the Eugene franchise has won a Most Valuable Performer award at the PIA winter conference, an honor granted to no more than 20 of 500 franchises nationwide.